You know who you want to ask to prom, but you don't know how you want to do it. Popping the prom question can be both exciting and nerve-wracking. Whether your crush is a friend from class or someone you admire from afar, use a creative proposal to make sure your dream date says yes. Ask that special someone to prom in a fun and flattering way. If you're dying to go to the prom with that special guy, let him know with this idea inspired by AreaTeen.com. Lie down in front of his house, in his driveway or on the basketball court where he shoots hoops. Have a friend trace your body outline with chalk. Leave a signed note behind that says, "I'm dying to go to prom with you." Place personal artifacts at the "crime scene" if you want him to guess who you are from clues. Include your phone number so he can call you with his "life-saving" answer. Sometimes the best words to express how you feel are someone else's. Dedicate a song on the radio to the date of your dreams. Have the radio disc jockey ask her to prom for you over the airwaves. Make sure she is listening at the right time by having a friend tell her to listen. Only try this idea if you're confident she will say yes. You want to be the cool, romantic guy at school the next day, not the sad, rejected sap. Live dangerously for the guy who loves spy films. Send a secret message on tape such as this one from LightPlanet.com: "Your prom date, should you choose to accept, will be (your name). You will be picked up by a person wearing (your prom dress color). Your date will feel like she may self-destruct if you do not reply by (date)." Send your prom request with flowers. 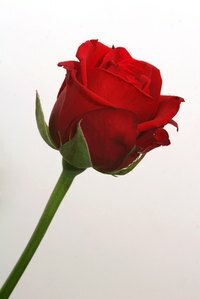 Leave a single rose or her favorite flowers with your note on her desk, at her locker, on her car or at her front door. Or, deliver the flowers in person after school or at her after-school activity or job. For an even more romantic touch, include a poem with the flowers. Maybe you have been slyly stealing glances and exchanging smiles or maybe you're not sure he knows you are alive. Break the ice with a little humor and something to freshen the breath just in case sparks ignite. Pass him a pack of Ice Breaker brand gum with a note such as "I think prom would be a great way to break the ice. Will you go with me?" recommends CoolestDates.com. Decorate his locker or desk with sticks of the gum for an even bolder approach.